Two second half goals set the Kilcock u-15 girls team on their way to a one point win over a gallant Nás na Rí side and in doing so capturing the Division 6 league trophy at Hawkfield on Saturday last, the 19th of October. The girls from North Kildare, managed by senior players Linda Byrne and Noelle Conlon were level at 1:02 a piece at the break but an Eve Powderly penalty and a dramatic last minute Emma O’Neill goal ensured that captain Saoirse Shannon would be raising the cup aloft at the end of a gruelling 60 minutes played in a wind and rain swept centre of excellence. Aoife McArdle had given her side the lead with the games first goal in the first period and Demi Lacey pointed in the first half. 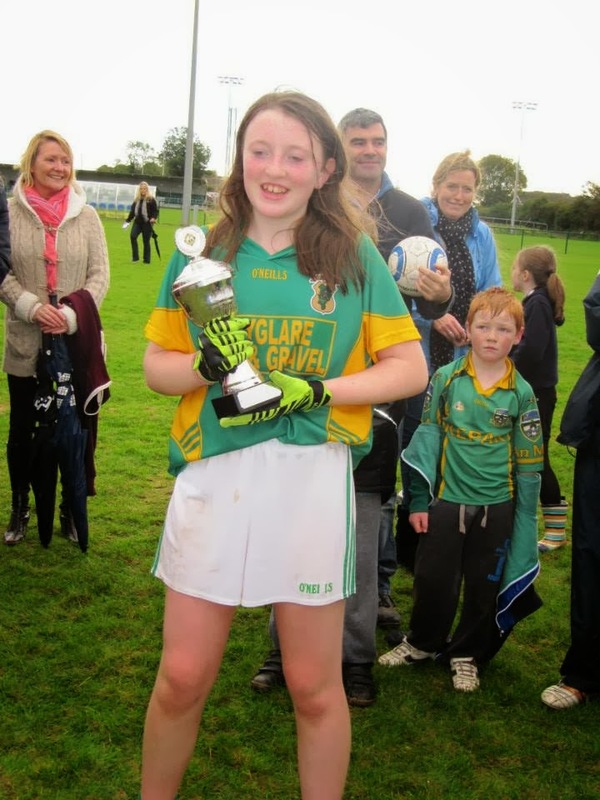 Midfielder and county u-16 player Aisling O’Connor was the games outstanding performer and cut through the oppositions defence time after time to create chances for her team mates. She was backed up well by a solid Charley Burke between the sticks while Aoife Boland, Laura Gibbons and Megan O’Connor were their ever reliable selves in defence. Eve Powderly worked tirelessly in midfield alongside O’Connor while upfront Saoirse Shannon and Sarah Lavin caused trouble with their excellent off the ball movement while full forward O’Neill bagged herself a goal and a point. Credit must go to both sides for the level of entertainment they produced in such dire conditions and though the young Naas side will be disappointed with the loss, they can hold their heads high after a creditable performance. The final whistle was greeted with scenes of jubilation from the girls in green and gold as they captured their first u-15 title in a number of years.